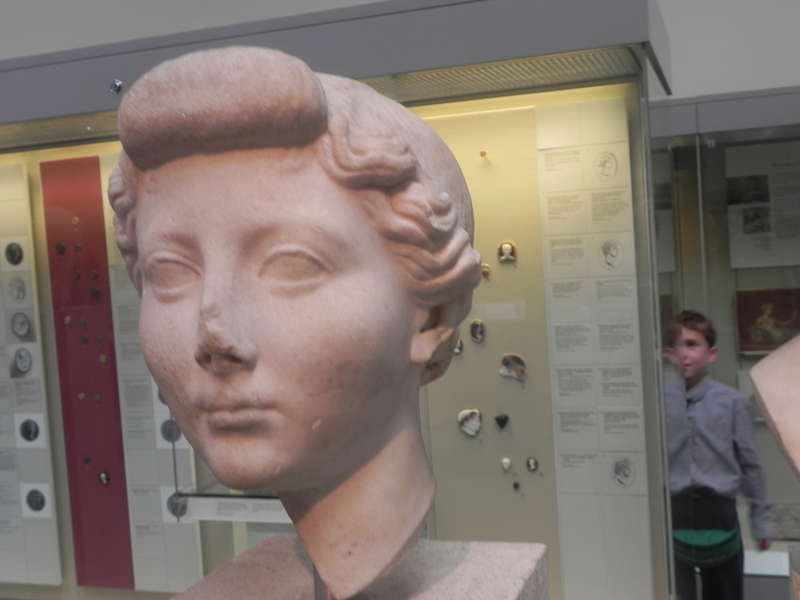 Photo of bust of Livia, wife of Augustus, taken at British Museum September 15, 2014. Nikon Coolpix P100 ISO 160 7.3mm f3.2 1/34. This is a history that covers Greece from its Dark Ages (1100–800 BC), through the Archaic (800–480 BC), Classical (480–323 BC), and the Hellenistic (after the death of Alexander) periods while the history of Rome runs from the expulsion of the kings to the death of Hadrian. There are, outside of the Homeric poems themselves, which actually come 3 or 4 centuries after the events they portray, few literary documents from that era. The evidence that exists is primarily archeological from the digs at Mycenae and elsewhere, and from the decipherment of the Linear B tablets. Those tablets, while not quite laundry lists, are for the most part accounting records, and like most things having to do with accounting, pretty dull. It is not until the Classical era that we get really good literary records, of the times, first in Herodotus, and then in Thucydides. So the treatment of Dark Age and Archaic material is pretty brief, and you won't find many answers as to what went on between the fall of Troy and the emergence of Athens. The big problem here is that the book attempts to give a survey of a thousand year period of history, and some of the events covered get a chapter, usually about 10 pages, though one chapter is a mere 5 pages. These events include the Persian wars, and the Persian wars, to each of which Robin Lane Fox devotes a ten page chapter. Socrates gets all of five pages. Now there is the fact that he has set out to write a survey, and adequate treatment of any of these things would make the book much larger, and would throw the rest out of balance. Perhaps a longer book in two or more volumes would have been advisable. One stylistic irritation is that he uses the expression in my view repeatedly. The obvious implication is that he is dissenting from one or more alternative views, views which may or may not be implied, but he never clearly enunciates those opposing views. There is an irritating error when he describes Nero's Golden House. (This involves a bit of math. The math part is in blue, so you can skip it, if you want.) He describes it as being 10,000 yards square. When something is described as being x units square, that means that the thing is a square, and that a side is x units long. When a thing is x square units that means that it is an object of unspecified shape that has an area of x square units. The District of Columbia is, originally, a square that is 10 miles on an edge, or 100 square miles, not 10 square miles. Fox's figure gives a building that is 5.62 miles on an edge with an area of about 32 square miles. He must mean 10,000 square yards, or 90,000 square feet, making a building about 300 feet on an edge. Fox mentions that what, for want of a better term, even though it may not be quite accurate, can be called the Roman proletariat, the poor citizens who resided in Rome proper, received a bread dole. He also mentions the grain coming in from the conquests, but does not explicitly link the two as regards causation. To what extent were the demands of the dolists the cause of imperial ambition? There is much of interest here, but there is not a lot that is new. Next up, a book about the founding fathers and science.